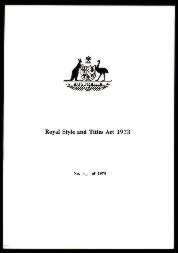 This document makes Queen Elizabeth II 'Queen of Australia', as the Assent to the Act changing the title set by the Royal Style and Titles Act 1953. It also eliminated both the reference to the United Kingdom, and the title 'Defender of the Faith'. The Schedule on page 1 states the new form in full as: 'Elizabeth the Second, by the Grace of God Queen of Australia and Her other Realms and Territories, Head of the Commonwealth'. The Labor Government led by Gough Whitlam proposed this change to the Australian form of the Royal style and titles to denote the precedence of Australia, the equality of the United Kingdom and each other sovereign nation under the Crown, and the separation of Church and State. The Bill was passed by Parliament and Queen Elizabeth signed her Assent to it at Government House Yarralumla. The Queen had indicated to the Prime Minister that she would be pleased to assent in person while she and the Duke of Edinburgh were in Canberra during the Royal Visit for the opening of the Sydney Opera House. 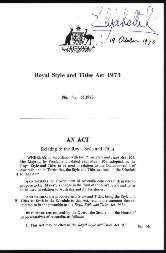 The comparison of the new wording of the Royal title with that chosen by Robert Menzies' Government in the Royal Style and Titles Act 1953 reflects the contrasting outlook not only of the two men and of the governments they led, but also of wider groups of Australians in the 1950s and the 1970s. There is another tiny but telling contrast which this document reveals in relation to the two Governors-General. 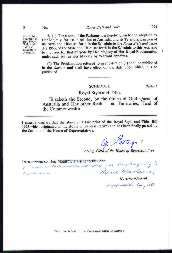 The 14 September notation by Sir Paul Hasluck on the assent original of the 1973 Act reads 'I reserve this proposed law for Her Majesty's pleasure'. On the 1953 document, Sir William McKell had written 'I reserve this Act for Her Majesty's pleasure'. The difference highlights the essential point that, under the Australian Constitution, a Bill does not become an Act when it is passed by Parliament. Legislation is not 'enacted' until it receives the signed assent of the Governor-General as representative of the Crown, or of course the signed assent of the monarch personally as in both these cases. 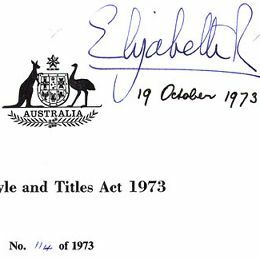 Hasluck's precise wording is therefore the correct form; the date of enactment is the date the Queen signed this document, 19 October 1973. The signature of Queen Elizabeth II adorns this Act.